The Open Heart sculpture reminds us that we have the ability to heal ourselves and others by tapping into loving source energy, available to all of us at all times. There is a space for offerings at the heart center. 2.75" tall. 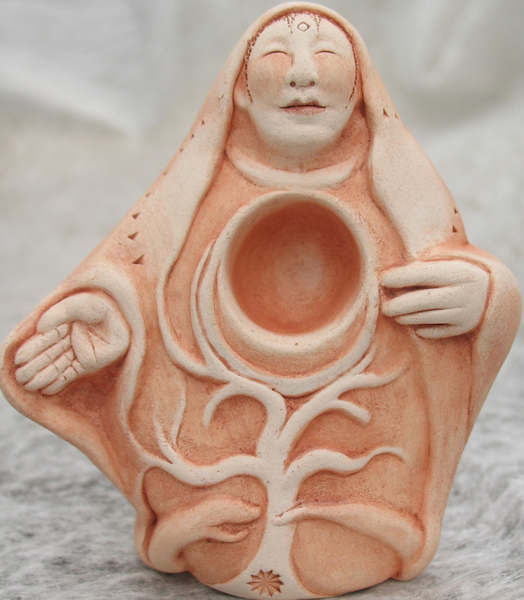 NOT TO BE CONFUSED WITH OUR 'MOON MOTHER' SCULPTURE MADE WITH A HOLE IN THE BOTTOM. NE PAS ÊTRE CONFONDU AVEC NOTRE SCULPTURE 'MOON MOTHER' FAIT AVEC UN TROU DANS LE FOND. NO SE CONFUNDEN CON NUESTRA ESCULTORA 'MOON MOTHER' HECHA CON UN AGUJERO EN LA PARTE INFERIOR. "Rooted in our beautiful Sacred Earth and drawing down Universal Wisdom, she opens and radiates compassion and kindness without judgement. Place a symbol or a prayer for all beings in the space surrounding her heart and know that our capacity to love and be loved is limitless."